The growing demand for fabrics that are eco-friendly has compelled many textile chemicals vendors to come up with technologies and chemicals that not improve the sustainability of textile production, finds Transparency Market Research in its new study. Leading players operating in the global textile chemicals market are focusing on improving their facilities and investing in R&D to meet customer demands. The Dow Chemical Company, for example, has introduced to its portfolio, an antimicrobial technology that safeguards textiles from the growth of harmful bacteria. Companies also need to participate in mergers and acquisitions so as to capture greater market shares. Some of the leading companies are OMNOVA Solutions Inc., Lonsen Inc., The Dow Chemical Company, The DyStar Group, The Lubrizol Corporation, Kiri Industries Limited, Huntsman International LLC, Archroma, Solvay SA, Covestro AG, and Pulcra Chemicals GmbH. According to Transparency Market Research, the global textile chemicals market will rise from US$21.02 bn in 2015 to US$29.15 bn by 2024, expanding at a modest 3.7% CAGR from 2016 to 2024. On the basis of application, home furnishing will lead. The segment is anticipated to expand at a 3.5% CAGR between 2016 and 2024, and be worth US$10,228.3 mn by 2024 from US$7,564.8 mn in 2015. Growing sales of towels, curtains, linen, carpets, and rugs that use different textile chemicals is expected to be the prime reason behind the growth of the home furnishing segment. By geography, Asia Pacific is currently leading in the textile chemicals market. Textile chemicals enhance textile properties by adding versatility and strength to it, as per their usage in the end-user industry. The need for better textiles will ensure a growth of the textile chemicals market and encourage manufacturers to come up with innovations and develop advanced textile chemicals, says TMR. Nanotechnology is being used for the manufacturing of smart textiles, which have anti-bacterial properties, enhanced chemical and water resistance, and mechanical strength. The introduction of such textiles is expected to boost the demand for textile chemicals. 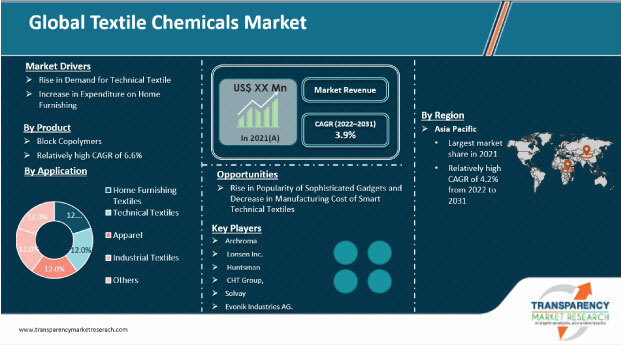 Growing agricultural activities, expanding clothing or textile industry, strengthening economies, improvement in healthcare infrastructure, and growing number of participants in sports activities are some of the factors boosting the global textile chemicals market. In addition to this, textile chemicals are also in demand from the packaging industry. Some of the factors restricting the demand for these chemicals include harmful effects of chemicals on the environment and health hazards for humans. The water disposed from textile chemical industries is polluted and causes heavy damage to water bodies. Also, chemicals from the textile chemical industries pollute the soil and have a negative impact. On the other hand, the use of chemicals to strengthen textiles in the construction sector will cause manufacturers to refrain from adopting conventional construction materials such as concrete, wood, and glass, and instead make use of textiles. This will ensure a positive outlook for the market in the future and create immense potential for growth.